The internet is a godsend. Whenever I get stuck in a food rut all I have to do is go on Google and there they are — plenty of vegan and vegetarian recipes for me to try. Sometimes I’ll try a recipe once and never go back to it. I had a disaster with a meat-free alfredo pasta and some cashews the other day which I’m still really disgruntled about; I had such high hopes. Other recipes become a staple part of my diet, like the ones listed here. Generally I like wholesome, natural foods with lots of complementary flavours, although I can never normally resist an enormous bowl of mac ‘n’ cheese (my biggest weakness in this world, aside from petting strangers’ dogs). Today I’m sharing five of the best vegetarian recipes I’ve found and why I love them so much. Enjoy, and please feel free to leave links to your own favourites in the comments! I’ve found that seasoning is the key to taking your meals from good to foodgasm and this recipe is a prime example of that. 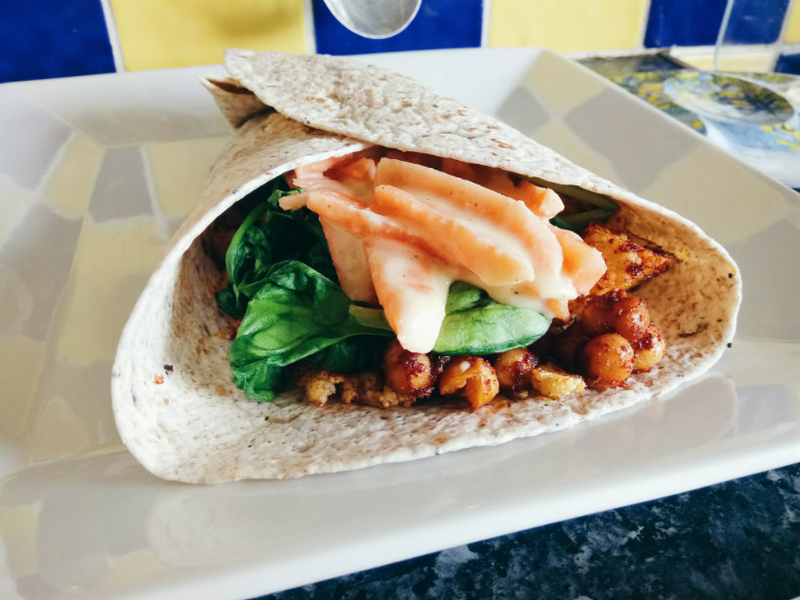 The cauliflower florets and chickpeas are roasted with BBQ flavours, while the slaw has mayo, honey, mustard, garlic, onion, celery salt, cider vinegar, and lots of lime to add a sharpness that offsets the smokiness of the BBQ. I always use dairy-free mayo and it’s easy to replace the honey with maple syrup if you want to make it vegan. As you might have guessed from the list of ingredients, this is not date food. You will get garlic breath and you will make a mess when you eat your tacos, but it’s so worth it. The perfect lazy-girl dinner, is this beautifully creamy but completely vegan. The mushrooms, red onions, garlic, wine, and thyme go so well together and although it’s quite a smooth sauce, it’s not too heavy. As the name says, you put all the ingredients together in one pot and leave them to do their thing, so it saves on washing up! Breakfast, lunch, dinner… is there any time of day you can’t eat shakshuka? This student-friendly dish can be made as big or small as you like. It’s essentially eggs, chopped tomatoes, and seasoning, but it tastes much better than it sounds. I normally throw in some extra veggies like mushrooms and being British, I have also been known to throw baked beans in there on occasion… which is probably a heinous crime, but it’s yummy, I swear! Shakshuka can be served with flatbreads or toast for dunking, particularly if you like a runny yolk (I love a runny yolk). I bloody love Mexican food. 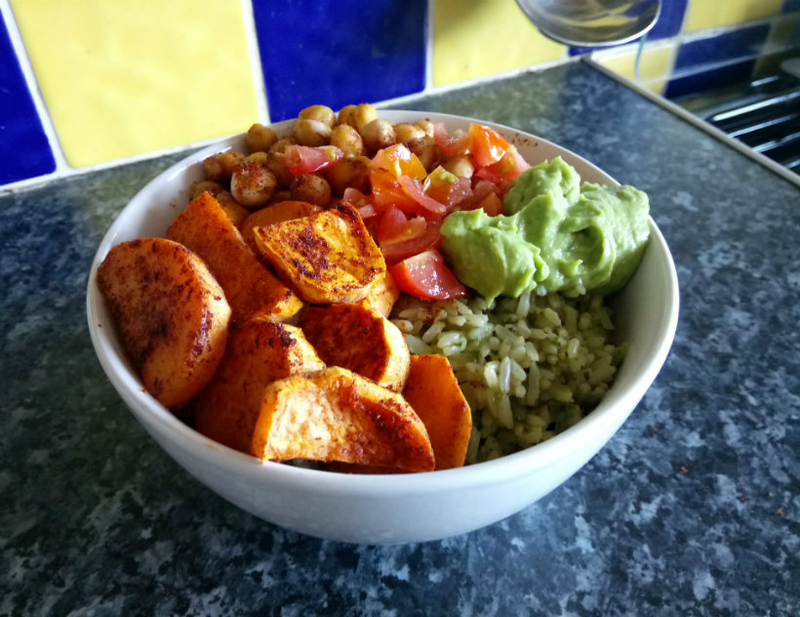 I’ve loved it for years, but since I stopped eating meat and fish I’ve developed a whole new appreciation for it because it’s incredibly easy to create vegan or vegetarian Mexican dishes. This one is a particular favourite because it’s full of different flavours. Sweet potatoes roasted with smoky paprika, fragrant green rice, lightly spiced beans… it’s all here. It’s a US recipe so I normally adapt it, swapping the black beans for red kidney beans or chickpeas and adding some homemade guacamole and salsa. (Can I find canned black beans in my local Tesco? No I bloody can’t.) This bowl is nutritious comfort food at its best. Mac ‘n’ cheese is my favourite comfort food of all time and this recipe adds a comforting twist in the form of roasted butternut squash and rosemary. You blitz the roasted squash cubes to make a puree and then add it to the cheese sauce with the herbs. This creates a certain sweetness and makes the sauce a little bit lighter — it’s completely and utterly delicious. I’m currently working on a vegan version of this meal but the dairy-free butter I use has such a distinctive flavour that it’s all you can taste. Any suggestions for a relatively bland vegan butter would be gratefully received! What are your favourite vegetarian dishes? Have you spotted anything that makes your mouth water? Let me know in the comments!